My heart is in my mouth as I focus on the most flexible, feline female on stage, perching her entire body with one hand on a piece of metal, and flipping her slinky legs in a curvilinear spinal motion. The variety of gymnastic, balletic movement in the stellar individuals that perform in Cirque du Soleil’s Ovo is quite extraordinary. The show is made all the more beautiful by the colourful ecosystem backdrop, playful costumes depicting grasshoppers, salamanders, insects teeming with life, and the live glorious, Portuguese music, and flicking courting calls of cicadas. To watch this in the 3Arena with your children is a memorable experience, mine are in their twenties and we were all awestruck. One of the phenomenal acts included trampoline style abseiling without any rope, and it would make you wonder are they real people. I can see how inspiring that act would be for young children with all the trampolines we have in Irish gardens. Some people mention Cirque du Soleil as a circus, there is some laughter, but the event more than demonstrates the perfection of human physical performance and individual talent in a two hour space of wonder and delight. There is a little story of romance, centred around the giant Ovo, the egg, symbolic of the cycle of life. 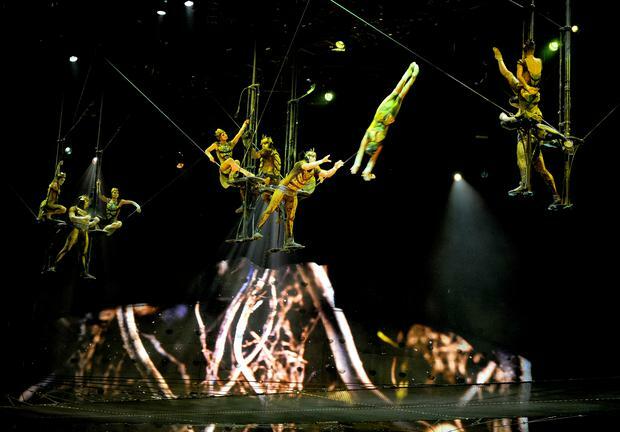 The cast comprises 50 performing artists from 14 countries, some perform individually as in the high-tech juggler, the tight rope walker and then groups combine dance and extreme acrobatic skills that would take your breath away. The audience was constantly applauding and concluded with a standing ovation. As a captivating event, Ovo is unique, not a play, or concert, not a musical or a film, utterly spellbinding and the best opportunity for a family outing. There are four more performances this week, from tonight until Sunday afternoon. It is the first Irish performance of its signature production and features new acts not seen before in Ireland. More than five million people worldwide attended Ovo since it premiered in Montreal in 2009.